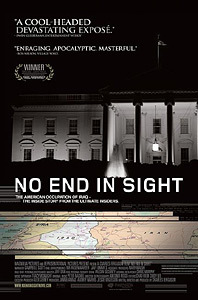 No End In Sight (Director: Charles Ferguson, USA, 2007): First-time director Charles Ferguson decided to make this film at a time when a number of books were being published about the Bush administration’s disastrous handling of the Iraq war. In fact, Ferguson has known George Packer, author of probably the definitive work (so far) on the war, The Assassins’ Gate: America in Iraq, for fifteen years. This helped to explain why there was a familiarity about many of the people I saw on the screen. What Ferguson has made is essentially an even more hard-hitting version of Packer’s book. Ignoring the question of whether the war itself was justified was a wise choice. By focussing strictly on how the war and occupation were planned (or perhaps more accurately, not planned), Ferguson’s film appeals to both the doves and the hawks, all of whom must agree after seeing the film that the Iraq war is now a full-blown debacle. In interviews about the film, Ferguson has gravely but confidently stated that he believes the US will have a significant military presence in Iraq for the next 20 to 30 years. His film quietly and soberly puts all the pieces together, building emotional power as it goes. He speaks with the people who were first on the ground in Iraq after the invasion, and we hear how ill-prepared they were. Then the hasty establishment of the Coalition Provisional Authority turned the country into, for all intents and purposes, a new dictatorship with L. Paul Bremer wielding incredible power and changing policy decisions with little consultation. The three most damning policies he pursued were the failure to proceed quickly with an Iraqi-led government, the de-Baathification of the civil service, and the dissolution of the Iraqi Army. Along with the failure of American troops to stop looting and establish law and order quickly after the invasion, Ferguson and his group of interviewees feel these bad decisions at the beginning of the war were significant in leading to the current chaos. This is a sobering and necessary film. And yet it would have been great to hear even a few suggestions for how to make things right. How can we learn from these mistakes and lessen the damage that’s already been done? Unfortunately, that film has yet to be made. The film is in limited release right now in the US, expanding over the next few weeks. There is no release date yet for Toronto. This entry was posted in Documentaries, Theatrical Release and tagged Documentaries, iraq, Theatrical Release. Bookmark the permalink.